trago-vos um vídeo que encontrei no youtube, de como fazer o chamado "water art nail polish"-É super fácil de fazer,basta verem o vídeo.Neste caso,os vernizes utilizados são néon para criar o efeito de arco-íris.De certeza absoluta que vou fazer isto um dia destes =). Espero que gostem tanto como eu!! i found this on youtube,the video teach you how to do the called "water art nail polish"- It´s super easy to do,you just need see the video that i post.In this case, the nails polish used are néon to create the effect of rainbow. I am sure that i´ll do this one day =). I hope you enjoy as much as i!! 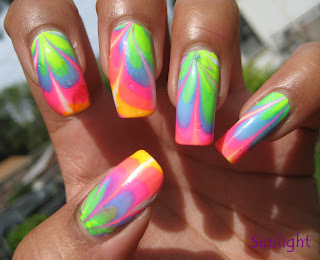 Those nails are insanely cool. I am glad that i helped you with tutorial. I don´t try yet but definetely i will! Wow! Thats so creative, and the result is incredible. This is awesome! I never knew this was so easy to do!